Avocado with Tuna gives you everything your body needs in a small pack. A super nutritious and tasty salad served in avocado bowls is a big hit in my house. 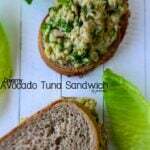 Whenever I have little time to prepare lunch or even dinner, Avocado with Tuna salad is one those recipes I think of. It is super easy, no cooking or baking is required and ready in minutes. Plus, it is so tasty, healthy and full of nutrition. Nothing could be better than this! If you love avocado and tuna, you have to try them together! Avocado with tuna will become your favorite avocado recipe. This is so good that I know you won’t want to share it with anyone and will eat both avocado bowls yourself. I shared my first experience with avocado some time ago. It was a dip made with a combination of avocado and cheese. Do you remember that? We have eaten avocado several times since then especially in thin slices on salads. I think we start to love this non-Turkish food. As it’s already summer here, we love to have salads for lunch. To make our salad more nutritional, we add various healthy foods into our salads including protein sources like beans, chicken or tuna. We were enjoying our tuna salad the other day with a few avocado slices on the top when the idea of stuffing avocado with tuna salad came to my mind. Flavors of tuna and avocado match wonderfully and roasted red bell pepper just balances them. I used parsley and green onions, but you can use any herb you like such as fresh dill or basil. 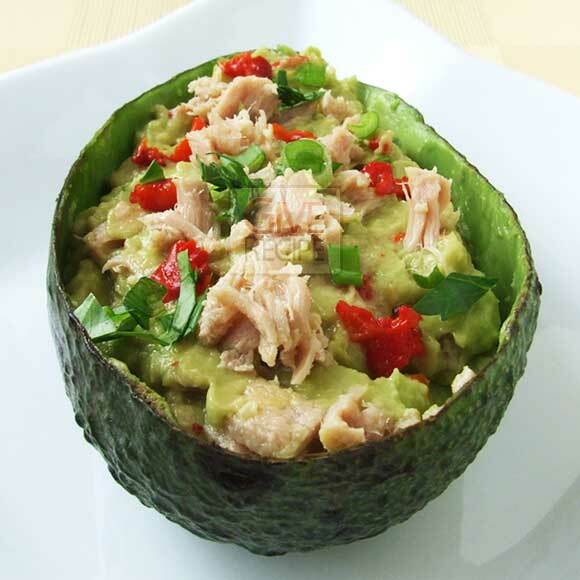 And make sure you add enough lemon juice in this avocado with tuna salad. Avocado bowls stuffed with tuna salad. Cut avocado lengthwise and remove its pit. Scoop out the flesh from one half. Add half of lemon juice, half of olive oil and salt. Toss in 2 tbsp tuna, half of herbs and half of roasted red bell pepper. Fill avocado half with this mixture and repeat the same steps for the other half. Note: You can save some of the ingredients for garnish as a final touch. I am down for just about anything with avocado- this looks like a fabulous lunch or light dinner dish! I put avocado on my tuna sandwiches but never thought to make it like this! Looks delicious! I love avocado, we eat them a lot in Mexico. They are great on salads too. I’ve never had it with tuna but I can imagine how delicious it tasted. Congrats on the top9! Wow that looks so healthy and fresh! I love avocado’s – love the presentation! This is so great. I love avocado and I love tuna. And I love the presentation here! This looks fabulous!!! Love tuna salad with a vinaigrette….and I’ve never added avocado! Genius!!! You always come up with such great recipes! I loved this one. Very special recipe.